Despite being among the most protected salt lakes in the American West, California’s Mono Lake in the eastern Sierra Nevada may reach its lowest level in a decade due to water management, climate change and drought. Photo by Jeremy P. Jacobs. 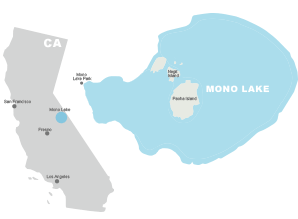 MONO COUNTY, Calif. — In 1941, Los Angeles came for the scenic lake here. After diverting the inflows to Owens Lake — setting it on course for ruin — the city extended its aqueduct 100 miles north in the eastern Sierra Nevada and captured virtually all of Mono Lake's tributaries. Like Owens Lake, Mono Lake's water level began to drop precipitously as Los Angeles pumped millions of gallons of water that would have previously run into the lake. Like Owens Lake, its salt level rose dramatically. The ecosystem of fish, alkali flies and tiny brine shrimp began to collapse, and a land bridge to one of the lake's islands — a pivotal nesting place for birds — was revealed, allowing coyotes and other predators to reach them. And, just like Owens Lake, air pollution skyrocketed as the lake receded and high winds kicked up salty dust from the exposed lake bed. But Mono Lake didn't go the way of Owens Lake. People stepped in to save it. Two landmark decisions — one from the California Supreme Court and another from state water regulators — made Mono Lake the most protected salt lake in the West. With 1994 regulations, California's State Water Resources Control Board established a system that put Mono Lake's health above Los Angeles' water exports. The regulations allowed Los Angeles to divert water only in amounts that would allow the lake to rise. It set out to accomplish several goals: Restore habitat, reduce salinity and protect air quality by keeping shorelines covered. 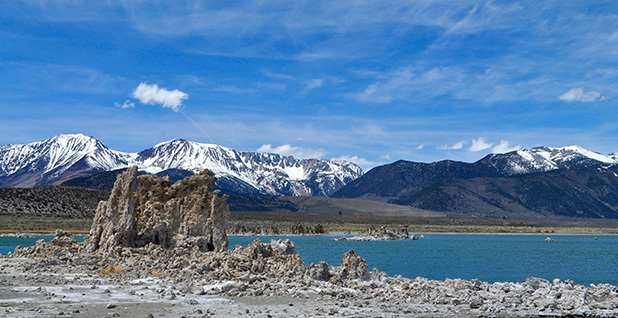 Now, advocates for Mono Lake tout it as a model that could work for other imperiled lakes. "We know what the solution is," said Geoff McQuilkin, executive director of the Mono Lake Committee. "Fill the lake, solve the air quality problem, solve the ecological problem. "It's already been accomplished," he said. Without the regulations, Mono Lake would have been doomed. But the ultimate goal — to restore Mono Lake's water to ecologically healthy levels — is far from realized. Due to a combination of drought and warming temperatures, Mono Lake is now close to its lowest level in 10 years and is nearly 15 feet below the goal of the regulations. By some projections, it doesn't look like the water-export rubric will work; the lake is no longer on a trajectory to reach target water levels. Air pollution around the lake consequently now reaches nearly 100 times the federal standard for coarse particulate matter during windstorms. It's the country's largest source of dust. 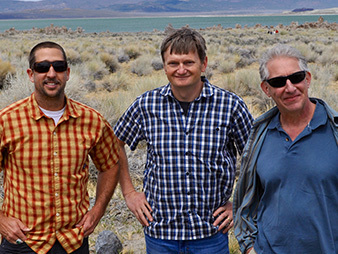 (Left to right) Phillip Kiddoo of the Great Basin Unified Air Pollution Control District, Geoff McQuilkin of the Mono Lake Committee and University of California biologist David Herbst have led efforts to preserve Mono Lake. Photo by Jeremy P. Jacobs. So Mono Lake has two stories. It shows what a vigorous defense of a salt lake can do, as well as what can be accomplished by regulating lake levels. But it also underscores that in a time of extreme drought and climate change, such forecasting may not work. Mono Lake may again be facing a crisis as soon as next year. David Herbst, a biologist with the University of California, Santa Barbara's Sierra Nevada Aquatic Research Laboratory, has been studying the lake for decades and was part of the initial effort to protect it. "The disconcerting thing for me from a historical perspective is this is about what the lake looked like in 1976," he said. "In 40 years, it's gone up and come back down." Mono Lake sits at the foot of the eastern Sierra Nevada mountain range, less than 20 miles from Yosemite. At about 70 square miles, it's smaller than Owens Lake (110 square miles), but it is much deeper, reaching more than 100 feet. It's known for its tufa towers, limestone structures that form when underwater springs rich in calcium mix with the carbonate-heavy lake water. Some 250,000 people visit the lake's southern shore every year to see and photograph them. The tufa towers were exposed when Los Angeles began tapping Mono Lake's inflows in 1941 to feed its growing population. Unlike Owens Lake, which has only one tributary, Mono Lake has five sources of inflow. The Los Angeles Department of Water and Power, or LADWP, diverted nearly all of the water from all of them, adding them to its more than 200-mile aqueduct. By the 1970s, LADWP was diverting up to 150,000 acre-feet of water from the Mono Basin per year, said Jim Yannotta, LADWP's aqueduct manager. 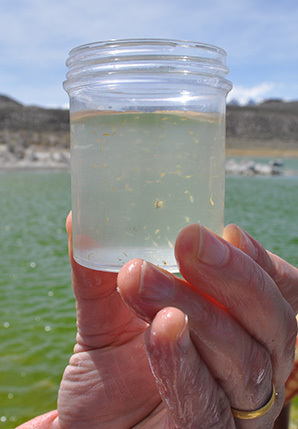 Herbst holds a sampling of tiny brine shrimp, a key source of food for birds at Mono Lake. Photo by Jeremy P. Jacobs. A decade later, the lake was dropping fast, killing fish and other wildlife. The Mono Lake Committee, the National Audubon Society and others — knowing what happened at Owens Lake — sued to try block LADWP's diversions. The case reached the California Supreme Court, and in 1983 the court sided with the advocates. The court established that Mono Lake, its streams and its wildlife were part of a public trust to be protected by the state. The opinion was a turning point for environmental law in California. In the following years, courts issued multiple orders limiting LADWP's water exports. The process continued to the State Water Resources Control Board. In September 1994, the board issued robust protections for the lake. Decision 1631 focused entirely on the lake level's elevation in relation to sea level. Its goal was to return the lake to an elevation of 6,392 feet. That was still 25 feet below the lake level before the diversions began in 1941 (6,417 feet). But the board concluded that at 6,392 feet — more than 15 feet above the level in 1994, 6,375 — the lake's ecosystem would be protected and its shorelines would be covered, so air pollution would be suppressed. Importantly, that level would also prevent a land bridge from reaching the islands in the center of the lake that are critical rookeries for gulls and other birds. The regulation sets limits for LADWP's exports based on lake levels. The regulations were hailed by environmentalists as unprecedented lake protections. The rubric put the lake's health on a higher footing than water diversions for human use. "It's really genius, because it adapts to whatever is going on," McQuilkin said. McQuilkin, who grew up in Pasadena, learned about Mono Lake in fifth grade. He returned to work for the committee after graduating from Harvard University in 1991 and has been there since. He's 47, but seems much younger. He has a near-encyclopedic knowledge of the lake, recalling lake levels in nearly any year since the regulatory decision. McQuilkin said that since water exports are determined by lake level, the lake can adapt to drought and climate change. 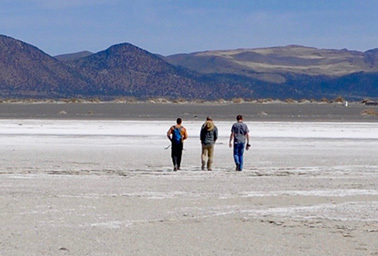 Kiddoo, Herbst and McQuilkin walk on lakebed that has been exposed as the lake recedes. Photo by Jeremy P. Jacobs. "If we are getting less water, or we get to the management level" — meaning the target of 6,392 feet — "Los Angeles gets what it gets," he said. "The lake level is still the trigger." He also noted the difference between the Mono Lake model, which benefits from having only a single diverter, and management plans for the Colorado River. The interstate compact for the river set allocations for the seven states that draw water. Those allotments don't change, no matter how much water flows in the river. Those Colorado River allocations were likely set too high to begin with, and they have led to nearly nonstop conflicts and litigation since they were established in 1922. The Mono Lake decision, McQuilkin said, is a "great approach, and it does put the environmental protection up there as the public trust required." After the 1994 regulations, the lake level shot up, almost too fast. By 1996, LADWP was able to begin taking 4,500 acre-feet, an amount of water that would cost the utility $3 million to get elsewhere. The trajectory used in the water board's modeling appeared accurate, and the lake looked like it would reach 6,392 feet in 20 years. That all changed, however, beginning in 2007. That year, the lake level reached 6,384.8 feet — right on the trajectory line. It hasn't been that high since. In 2012, California's historic drought hit, having a punishing impact on Mono Lake's inflows, particularly snowmelt and runoff. The lake level continues to fall: It is now at 6,378.3 feet and is forecasted to decline to 6,377.8 feet by next April, just barely above the level where Los Angeles is allowed to take 4,500 acre-feet. It looks like it will hold at around that level for the next year, according to McQuilkin. But if the eastern Sierra Nevada has another poor water year, Los Angeles may be cut off for the first time since the mid-1990s. LADWP's Yannotta emphasized that — at 4,500 acre-feet — the utility is already taking far less than what it originally diverted. "When you look at the exports, we're just taking a fraction ... of what we historically did," he said. "So we're being mindful there." Yannotta said LADWP is committed to abiding by the requirements of the regulatory decision. If the city is cut off, he said, it would likely look to make up the 4,500 acre-feet in conservation measures. Without the regulatory decision, McQuilkin said, the drought would have decimated the lake. Because of that decision, the lake has been able to weather it. Now, "we have essentially eaten through the buffer that was established thanks to those rules that limited the diversions," he said. "Now we are back down, sitting close to the 6,377 [foot] level." That level is problematic for Phill Kiddoo. It's up to Kiddoo, who looks a little like — and sounds a lot like — the actor Nicolas Cage, to bring the area including Mono Lake into attainment with federal air standards for harmful coarse particulate matter. And Mono Lake isn't close. There is currently about 20 square miles of exposed lake bed, or playa, at Mono Lake, most of which is on its north shore. Kiddoo is particularly concerned about 10 of those square miles that will remain uncovered as long as the lake level doesn't reach the 6,392-foot goal. On a spring day, 15-mph winds were enough to begin whipping dust into the air near Kiddoo's state-of-the-art monitoring station. Winds in the area can reach 70 mph, and Kiddoo measures exceedances of the federal standard of 150 micrograms per cubic meter up to 25 days per year. Occasionally, the monitoring will detect levels approaching 15,000 micrograms per cubic meter, 100 times the federal limit. Kiddoo checks air pollution levels at a monitoring station on the lake’s north shore. Photo by Jeremy P. Jacobs. 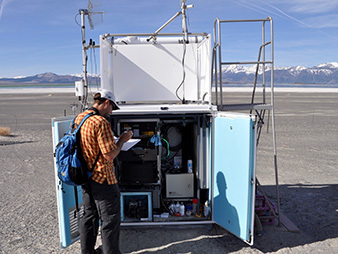 Now that nearly 50 square miles of dust controls have controlled emissions at Owens Lake, Kiddoo is trying to bring attention to Mono Lake, the largest source of coarse particulate emissions in the country. He calls Mono Lake the "needle in the haystack" of air pollution in the area. "Owens Lake being the haystack — you can't ignore it," Kiddoo said. "That's fixed. All that's left of the haystack is gone, and now we just see the needle." Kiddoo supports the idea behind the regulatory decision, allowing the lake level to rise to control dust emissions. But he said the specifics need to be revisited. It's unclear, Kiddoo said, whether the 6,392-foot goal can be achieved using the 4,500-acre-foot/16,000-acre-foot export levels in the regulations. "We at the district have been saying it needs to be re-evaluated," Kiddoo said. "It appears to not be working." Herbst, the UCSB biologist, added that wildlife is again on the brink of crisis. The land bridge reaching bird roosting locations on the islands is nearly exposed. Salinity has reached 8.8 percent — more than double that of ocean water. If it reaches 10 percent, the ecosystem may deteriorate. "The fly larvae and brine shrimp, to pay the bills, have to have more food as the salinity goes up," Herbst, 62, said. "But the salinity that's limiting them is limiting their food resource. Everything is sort of pinching in on them as the salinity goes up." The 1994 regulations will be revisited in September 2020, and Kiddoo said he will push for more air quality protections. LADWP's Yannotta said he wasn't aware the pollution at Mono Lake was reaching levels comparable to Owens Lake. "If there is an issue that is associated with the operations of Los Angeles, that would be something we'd have to address," he said. Kiddoo would prefer to control dust using the lake level. Installing intrusive dust controls like those used at Owens Lake — square miles of gravel, tilled areas and other measures — would be much more difficult at Mono Lake because it is protected as a scenic area. McQuilkin is more optimistic than Kiddoo. He notes that, historically, lake-level rise has occurred in large surges about every 50 years. In between, the lake level fluctuates some, but not much. That, he said, "supports the analysis that the lake will get to management level, but in bursts of rapid rise, not via slow-and-steady change each year." There are two problems with that approach, however. The first is that Kiddoo needs to bring the area into attainment with air standards now. If the last major rise was during the high-water years of the late 1990s, Kiddoo can't wait until 2040 for pollution controls. The other, Herbst said, is that those models may not apply anymore. "The historic range of water here that they've been using to say, 'This is what's average in California,' isn't accurate," Herbst said. "And it's certainly much less accurate than it would be because of the changing climate scenarios. "The new normal is a moving target." Coming July 11: Utah's Great Salt Lake under siege.